Parque Nacional Torres del Paine in Chile is the finest National Park in South America, at least some of our guide books say. 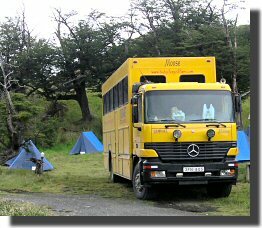 It is certainly very popular with overland groups and expensive by Chilean standards. Currently it is also wet and windy. This web page comes to you from a very wet car park, just inside the park, opposite Villa Serrano . If it wasn't raining, cold and misty, it would be a fine place to spend the night (S51.228243 W72.974880). Nearby is an official campsite which offers nothing of value for $12USA per van per night. What it offers people with tents is somewhere under cover to pitch their tent out of the wind! Today we also visited the main campsite at Camping Lago Pehoe ($17USA per van per night). In this campsite there were two Exodus Overland trucks, one Budget-Travel truck, one Toucan-Travel truck and one large, black, UK-registered truck with no company name. We have also seen a Rotel (Rolling Motel) truck in the park. We also visited Hosteria Lago Grey where you could eat a set lunch ($31USA per person) if they could be bothered to serve you. You could also take a three hour boat trip from the hotel to the Glaciar Grey for $50USA. We ate in the vans and admired the glacier thru the rain and mist (no charge). Given reasonable weather, the scenery in the park is magnificent and well worth the $20USA per person entry fee. However it is certainly best to bring your own food and wild camp. There is no shortage of places to wild camp and there are no signs that it is disapproved of (at least in a campervan). So far we have seen numerous guanacos, a few silver foxes and families of geese. We are hoping, but not expecting, to see a puma during our stay in the area. On our first night in the park we wild-camped at a great spot just beyond the car park for Salto Grande (above) at S51.068253 W73.000330. Whilst the parking spot was idyllic, the wind was not. By late evening the wind speed had risen to around 50kph and both Mel and Mog had to be repositioned to reduce the amount of rocking. In spite of this, Mo was actually "seasick" whilst parked in Mel on dry land!